The Big Bang Theory has a lot of life left in it and it will be interesting to see how they manage to continue the momentum. The Big Bang Theory will start its ninth season this fall, and it certainly doesn't show any signs of slowing down. As witty, sharp and sometimes biting as ever, the show is just as entertaining as it was in Season 1. With Season 8 coming out on Blu-Ray on September 15, 2015, you may want to take a look back at the past year and relive all the funny (and a few not so funny) episodes. Season 8 starts about a month after season seven ended. Sheldon (Jim Parsons; Garden State) is mugged in Arizona after a month long "trek" visiting many of the train stations throughout the country. Penny (Katey Cuoco- Sweeting; 8 Simple Rules) and Leonard (Johnny Galecki; Roseanne) are living together while not planning their wedding. And the rest of the gang is just living their lives as usual. This season saw some hilarious moments, like when the guys accidentally contaminate a clean room they were working in by letting in a bird, when Sheldon and Raj (Kunal Nayyar; Sanjay and Craig) try to work together in a steam tunnel and last less than 30 minutes, or a late season episode when Leonard's and Sheldon's mothers finally meet; The moms are played by the always fantastic Christine Baranski (The Good Wife) and Laurie Metcalf (Roseanne). The season also pushed Amy's (Mayim Bialik; Blossom) and Sheldon's relationship along, as he admits he loves her and the shocker of the season, of course, happened in the last minute when Amy breaks up with Sheldon just as he is getting ready to propose. Unfortunately, this season also dealt with the loss of Howard's (Simon Helberg; Studio 60 on the Sunset Strip) mother, Debbie, and the real life death of cast member, Carol Ann Susi (Just Go with It). The series handled the loss beautifully, mixing its usual humor with more somber moments in a fitting tribute to the hilarious woman nobody ever saw. The two-disc Blu-ray offers some worthwhile extras including a funny gag reel and a loving tribute to Carol Ann Susi. Less interesting are segments on super-fan contest winners, The 2014 Comic Con panel and when Chuck Lorre, Jim Parsons and Kaley Cuoco-Sweeting received stars on the Hollywood walk of fame. Presented in 1080p High Definition video, the quality is terrific with excellent hues and shading throughout. The DTS-HD Master Audio 5.1 allows the viewer to hear every line with crystal clear sharpness and enjoy the live studio audience's laughs as if those of us at home were actually there. As a fan of the show, even when I don't quite understand what they are talking about, I think this season was excellent and lives up to past seasons. This is one series I don't feel has lost any of its quality and humor over the last several years as so often happens unfortunately with great TV shows. The Big Bang Theory has a lot of life left in it and it will be interesting to see how they manage to continue the momentum. For now, though, I recommend grabbing the season eight Blu-ray and enjoying all the laughs one more time. 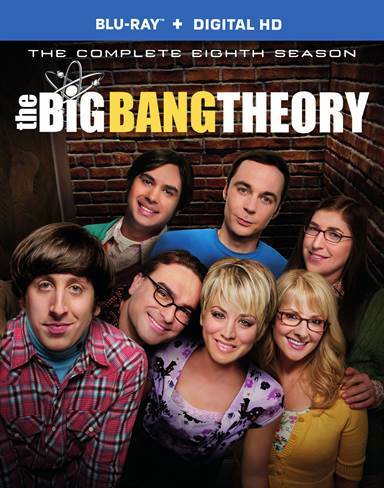 Download The Big Bang Theory: The Complete Eighth Season from the iTunes Store in Digial HD.